Versatile and robust numeric data processing application! Datamate™ Numeric Processor is a versatile and robust data processor for all you number crunching needs! Normalize, standardize, scale, and manage missing data and data outliers quickly and accurately. Complete with descriptive statistics, robust reporting, and intricately configurable data output formatting. • Powerful, yet easy to use! • Fast, accurate, robust, and precise • Normalize, standardize, and custom scale your data • Replace or skip missing data • Replace or skip data outliers • Full descriptive statistics • Includes skewness and kurtosis • Save and load data processing rules • Add column headers to output • Add data prefix and suffix to output • Auto select numeric columns of data • Specify range of data rows for processing • Remerge processed data with unprocessed / textual data • 11 data output delimiter choices • Built in Quick Start and Help Guides • And more! *Quick and helpful online support available 7 days a week! We built Datamate™ Numeric Processor to be versatile and intuitive to use. To this end we we've included Next and Back buttons to guide you through the steps of processing your data, while at the same time allowing you to navigate through the application freely as other than Importing Data and Selecting Columns, you can apply the data processing rules in any order you want or not bother at all to configure rules you don't need as the preset default values will allow you to bypass any section of rules without configuring them or applying them. You can simply import data that you want to run descriptive statics on and do no more or additionally just output the data into another format. But the real power of Datamate™ Numeric Processor comes from configuring and applying the data processing rules. Plus you can import mixed data, in other words data with numeric and non-numeric/textual values, and process just the numeric values then remerge the non-numeric/unprocessed data with the processed data during the output phase. 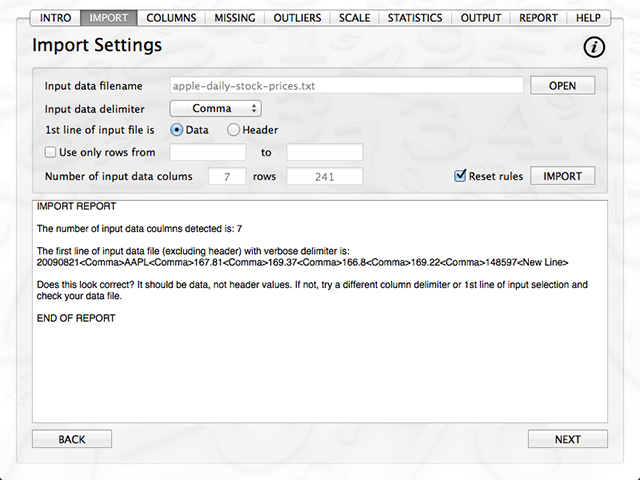 You can also append prefixes and suffixes to your processed data with just the click of a few butons. 1- Click on the Start Button or select the Import Tab and click on the Open Button and choose the data file you want to process. Choose the Data Delimiter for your data file. Click on the Data or Header option depending upon whether or not the first line of your input data file is actual data for processing or textual column headers. Click the Import Button. An import report will be generated indicating how the import process went and display warnings, notices, and errors it encountered if any. 2- Click the Next Button or Select the Columns Tab. Click on Auto to have Datamate™ automatically choose all numeric columns of data it finds for processing or you can manually add and remove columns. 3- Click on the Next Button or Any Tab and configure and apply the rules for processing your data or just run statistics on it or output the data in a variety of formats and styles with added column headers, data value prefixes and suffixes as you like. Also, there are helpful information buttons on each tab for quick reference and a processing report is generated which you can copy or save. You can save the processed output, processing rules, and processing reports to any file location, but Datamate™ creates default directories for your convenience although you are not required to use them. The one hard and fast rule is the filename extension for the data processing rules file must adhere to our pre-defined extension, which is .dnpr as the application will not be able to load data processing rules with any other filename extension. You can save the rules you configured for processing your data and load them at a later time to use them for processing data that is of the same format/structure. By that we mean the column count and column alignment, etc. is the same for the files in question. If you choose to load rules you've previously saved you will only need to open and import the new data file then select the columns of data for processing. Note, if you have already loaded the rules before you've imported the data, then uncheck the reset rules box. Or you can import the new data file first, then load the rules. You won't see the application's controls reflect the loaded data processing rules settings, but they are at work behind the scenes, so no need to go through the rules views applying them. Just load your new data file, select the columns, and run your output. But if you wanted to modify the loaded rules, that's perfectly Ok to do, you can re-save them too. Input Data Filename: The name of the file containing the data to be processed. Choose the file by clicking on the OPEN button. Open Button: The button used to open a file dialogue box and choose the input data file for processing. Input Data Delimiter: The character/symbol which separates each row of data into separate columns. Choose the delimiter from the popup menu. 1st Line Of Input File Is: Select what the first line of the input data input file contains, either Header or Data. Use Only Rows From: The range of rows in which you want to process. To utilize, check the box an enter any integer values for the From and To text boxes. Number Of Input Data Columns And Rows: The number of rows and columns selected for processing is displayed after importing the data file. Reset Rules: Checkbox for indicating whether on not you want to reset the processing rules upon importing the data file. If you have loaded processing rules or have setup rules and simply want to process more files of the same format/structure and want the same rules applied, then uncheck this box before you import any new data files. If you are importing a data file with a different file format/structure and need to set up new rules, then leave this box checked and all of the rules will be reset to their default values upon importing the new file. Import Button: The button used to import the input data file selected for processing. 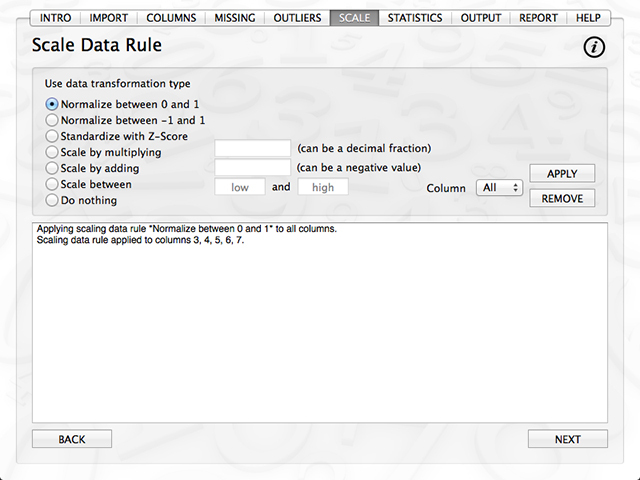 Auto Select: Datamate™ automatically selects all of the numeric columns of data it finds. 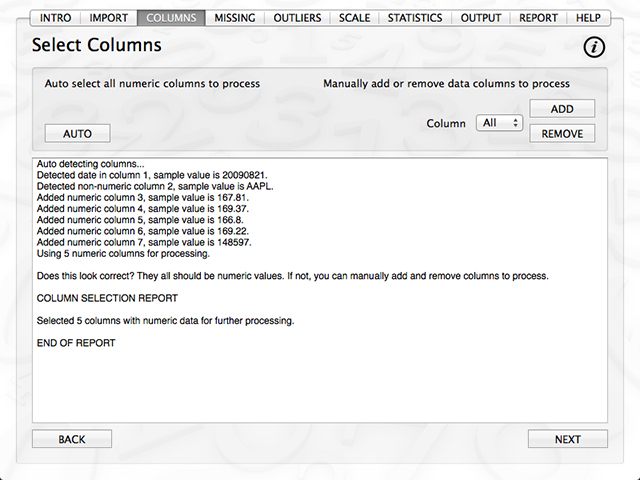 You can use auto-select and then manually add or remove additional numeric data columns for processing. Manual Select: Manually add and remove columns of data you want to include or exclude for processing. Use the popup menu to choose the columns and then click on the apply or remove button. Missing And Non-Numeric Data Rule: The rule for which you want to apply to any missing or non-numeric data Datamate™ comes across prior to processing the data. Select the rule you want to apply and input a numeric value if you choose the custom value replacement method. Replace Outliers With: The value in which Datamate™ will replace any outliers it encounters during processing. For custom replacement values entet one to use in replacing outliers found below the mean of the column of data and one to use in replacing outliers found above the mean of the column of data. 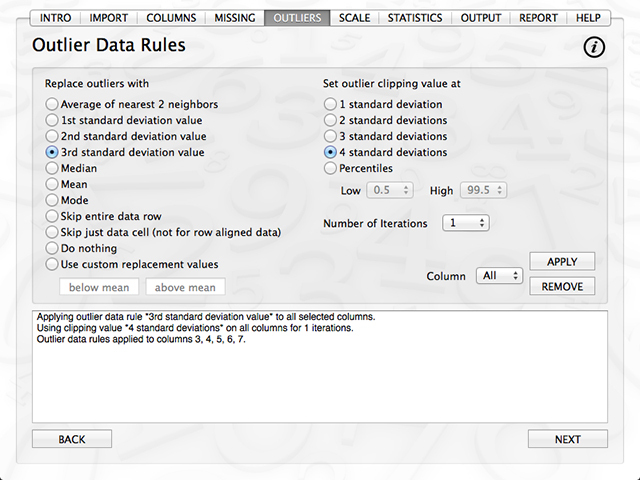 Set Outlier Clipping Value At: The value in which Datamate™ will use to define what an outliers is during processing. Number Of Iterations: The number of time in which Datamate™ will repeat the cycle of removing any outliers it encounters during processing. The concept here is that if you have extreme outliers in the data the mean of the data will be biased by the outliers and after one pass of removing the outliers it should provide a more accurate calculation of the mean in which you can then go through again to remove outliers related to the new mean derived from removing the outliers in the previous pass (assuming a number of iterations greater than one). Use Data Transformation Type: The type of data transformation you want Datamate™ to apply to your data. Descriptive Statistics: Full set of descriptive statistics is produced including skewness and kurtosis with the selected rule sets applied according to the checkboxes for the columns chosen from the popup menu. Output Data Column: Checked will include the column of data in the output file, unchecked will not. Apply Missing Data Rule: Checked will apply the missing data rule to the corresponding column of data, unchecked will not. Apply Outlier Data Rules: Checked will apply the outlier data rule to the corresponding column of data, unchecked will not. 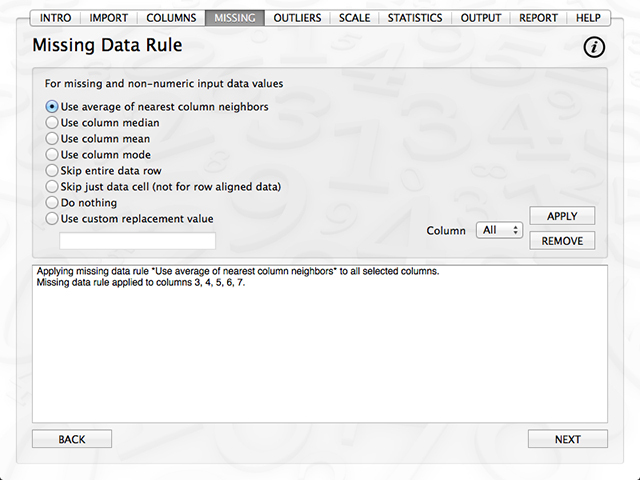 Apply Scale Data Rule: Checked will apply the scale data rule to the corresponding column of data, unchecked will not. Round Off Output To: Checked will round off the data of the corresponding column to the indicated decimal places of precision, unchecked will not. Add Column Header: Checked will add the designated column header to the corresponding column of data, unchecked will not. Add Data Prefix: Checked will add the designated prefix to the all of the data values in the corresponding column of data, unchecked will not. Add Data Suffix: Checked will add the designated suffix to the all of the data values in the corresponding column of data, unchecked will not. Use Output Data Delimiter: The data value delimiter for the output data. Add new-line character to end of last line: Checked will add a new-line character to the end of the last line of data as some data processing systems require this to read the last line of data, unchecked will not. Save Button: Opens a file dialogue box for choosing the filename and directory location to write the output data file. Load Rules Button: Opens a file dialogue box to select and automatically load a previously saved set of data processing rules. 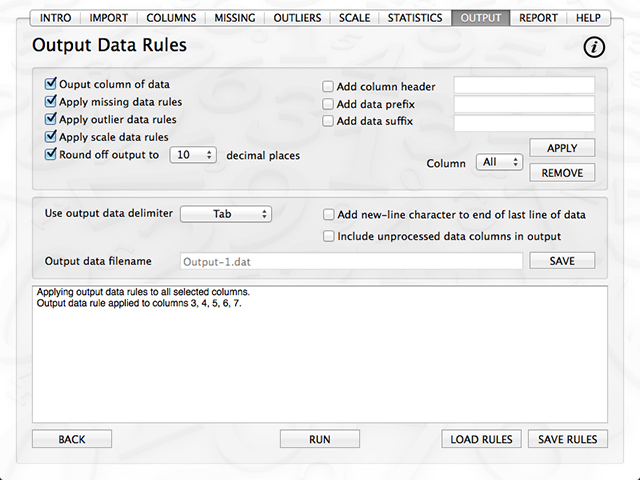 Save Rules Button: Opens a file dialogue box to select to save the current set of data processing rules.